What could be worse than losing your entire family in a single night? Twenty-five years later, Cynthia Archer is about to find out, in a lightning-paced psychological thriller of secrets, lies and obsessive love. 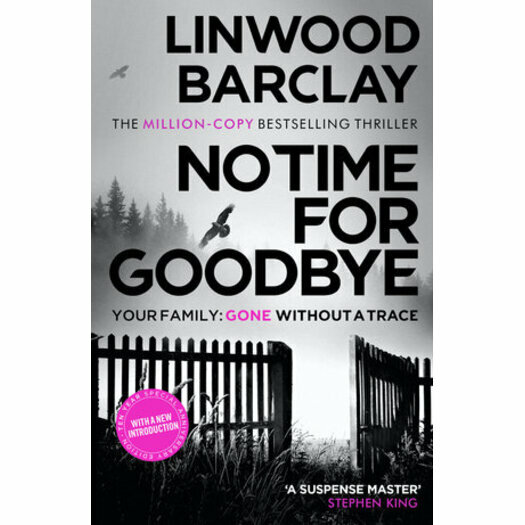 The master of the shocking twist Linwood Barclay's mega-selling No Time For Goodbye - a lightning-paced psychological thriller full of secrets, lies and obsessive love. On the morning she will never forget, suburban teenager Cynthia Archer awakes with a nasty hangover and a feeling she is going to have an even nastier confrontation with her mom and dad. But when she leaves her bedroom, she discovers the house is empty, with no sign of her parents or younger brother Todd. In the blink of an eye, without any explanation, her family has simply disappeared. Twenty-five years later Cynthia is still haunted by unanswered questions. Were her family murdered? If so, why was she spared? And if they're alive, why did they abandon her in such a cruel way? Now married with a daughter of her own, Cynthia fears that her new family will be taken from her just as her first one was. And so she agrees to take part in a TV documentary revisiting the case, in the hope that somebody somewhere will remember something - or even that her father, mother or brother might finally reach out to her . . .
Then a letter arrives which makes no sense and yet chills Cynthia to the core. And soon she begins to realise that stirring up the past could be the worst mistake she has ever made . . .
Linwood Barclay is the international bestselling author of many critically acclaimed novels, including No Safe House, a Tap on the Window, Trust Your Eyes and the Richard & Judy 2008 Summer Read winner and number one bestseller, No Time for Goodbye. He lives near Toronto with his wife.